Weddings are supposed to be the most memorable occasions in those people’s lives who are themselves tying the knot, as well as, the close family members and friends of the bride and groom. Thus, wedding gifts must also be special enough to match the importance and significance of the occasion. These gifts come in a variety of shapes and sizes, depend on both the preferences of the presenter, as well as, their relationship with the couple-to-be. Nowadays it has become possible to have practically the world within one’s living room thanks to the advent of the World Wide Web. Therefore, people interested in buying wedding gifts can opt for one of the several online portals that provide a vast collection of such items. Jewellery pieces continue to be among the most popular choices when it comes to wedding gifts. In fact, necklaces available in wide variety can be ideal for gifting to the bride on this special occasion. One of the most popular of choices consists of necklaces of great artisanship having precious stones such as ruby or emerald engraved into them. They make for extremely eye-catching neck wear. Buyers can also opt for necklaces that come with engraved pearls and they are bound to look stunning on the bride they adorn. Necklaces come in a variety of other makes with the Kundan necklaces being among the more popular. The choice includes Kundan necklaces with engravings of precious stones, as well as, those with pearls or white beads. These necklaces with matching earrings certainly make for extremely attractive wedding presents, which the newlywed bride is going to appreciate quite a lot. Apart from breathtaking necklaces, wedding gifts can also comprise of various other items of value and use. Pudding bowls and sets, as well as, serving trays made out of German silver can make for excellent showpieces. These items are comparatively lighter to the pocket but can be extremely useful in decorating any households with a touch of creativity. Other great wedding gifts ideas include presenting traditional and pillar marble handicrafts clocks, which can help the presenter of that gift, stand out from the crowd. These items can make for excellent wedding gifts. 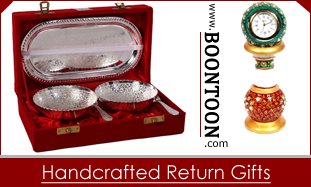 Can Handicraft Items be best suited as Gift?